Watch live at 22:00 on 7 February. In a recent LB.ua interview, deputy speaker Oksana Syroyid has flatly ruled out a possibility of Self-Help joining the coalition. Moreover, she openly stated that the presidential administration had been carefully monitoring the approval ratings of the party and its leader, Lviv mayor Andriy Sadovyy. Has anything changed as the situation with the garbage in Lviv kept deteriorating, and the Petro Poroshenko Bloc called on political forces to reunite? Can the parliamentary majority be reformatted? Oksana Syroyid talks with Sonya Koshkina on the situation in the party, the relationship with the government, the parliamentary agenda for the next session, on the new line-up of the Central Electoral Commission will be voted, and many other things. 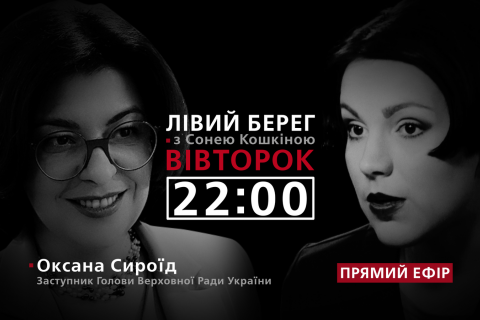 Tune in tonight on Channel 24 TV at 22:00 Kyiv time.